Eva Chyrsanthe gave us some interesting history lessons in August. It began with the fact that there were no chickens in San Francisco. Or not enough, anyway, to supply enough eggs to the growing town of San Francisco in 1849 and its visiting hungry miners. And with no eggs, no cakes either. People knew of the Farallon Islands. Russians had hunted seals there. Russians at least were fond of the bird eggs. And they were plentiful. The islands are a fecund little spot sitting as they are on the edge of a great ocean precipice, the islands and its waters and the creatures therein and on fed by a great upwelling from the deep. All it took was one enterprising person, and egg problem “solved”. That person was “Doc” Robinson. He and his brother in law went to the islands and poached (as in stolen, not as in cooked) $3,000 worth of eggs. At $1 for 1-12 eggs, that was a lot of eggs. 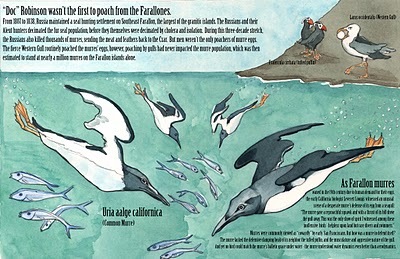 And the pair had actually lost half their eggs in the rough waters of the Farallones. The eggs were the eggs of the common murre. They are 2-3x the size of a chicken egg. They had a fiery red yolk, and although they did not keep to long, people liked the taste. Robinson took his money and started a theater (Eva referred to him as the John Stewart of his day, as he wrote satires, and was often lampooning people), but others quickly took up his idea and the egg trade began. The common murre eggs had two other things going for them: the shells were very tough so they could be stuffed into a vest safely, and the murres were easily driven off (unlike other residents of the island – western gulls and tufted puffins). That’s not to say the job was easy: Western Gulls were equally adept at thieving the eggs, and used the men to their advantage, often attaching the men. The poachers covered head to toe in guano often had to scale the cliffs of the island, and quite a few men fell–and although sharks tended not to be in the water when birds were nesting, the waters themselves are cold and dangerous enough. The dominant force in the trade was the Pacific Egg Company (it had several aliases), but there were plenty of independent poachers, plus pirates, plus the Federals. The Federals were there trying to build a lighthouse, partly to save ships from shipwrecks, but also to lay claim to the island so Joseph Limantour couldn’t. The lighthouse keepers were often in conflict with the poachers (one lighthouse keeper, Amos Cliff, wanted the trade for himself). The most famous conflict was in 1863 with a skirmish between independents and the Egg company that left 2 men dead. The company kept its upper hand until finally they were kicked out for attacking a lighthouse keeper. The poaching went on under the independents. There have been some claims that the egg poachers were Italian mafioso, but Eva put those claims to rest. Not only were there not alot of Italian names in the Company rosters, most of the Italians were from Northern Italy, many political refugees and supporters of the great Italian revolutionary Giuseppe Garibaldi. Regardless eggs were harvested. At the peak 500,000 Murre eggs were taken of the islands in 1854. The numbers fell through the end of the century, with 100,000 being taken in 1896. The biggest factor in the decline might be the growth of the chicken industry in Petaluma, starting in 1875. [the Farallon Islands] are hereby reserved and set apart for the use of the Department of Agriculture as a preserve and breeding ground for native birds. It is unlawful for any person to hunt, trap, capture, wilfully disturb, or kill any birds of any kind whatever, or take the eggs of such birds within the limits of this reservation, except under such rules and regulations as may be prescribed by the Secretary of Agriculture. This is Executive Order 1043 signed by President Theodore Roosevelt February 27, 1909. Chalk another good one up for Teddy as well! Even with this long post, I can’t do the talk full justice. You can read some more about the topic in numerous places, but try here and this piece in Bay Nature by Juliet Grable. Stay tuned for more about Eva Chrysanthe’s book, Garibaldi and the Farallon Egg War.